What do you get the panda cub who has almost everything? 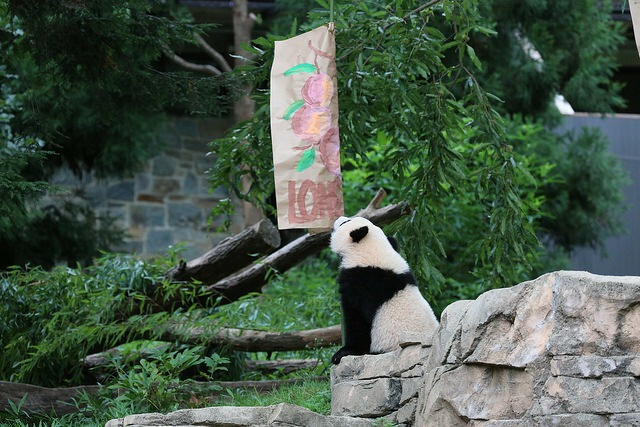 The National Zoo gave its cub a traditional Chinese celebration and, more importantly, a cake. In conjunction with the Embassy of the People’s Republic of China, the Smithsonian's National Zoo feted its prized cub Bao Bao Saturday morning with a modified Zhuazhou . In the traditional Zhuazhou, objects are placed in front of the child and whichever object the child chooses will determine the child's future skills and life path. In Bao Bao's case, zoo staff placed three posters in her enclosure with images of peaches (a Chinese symbol of longevity), bamboo (health) and pomegranates (fertility) painted on them respectively. 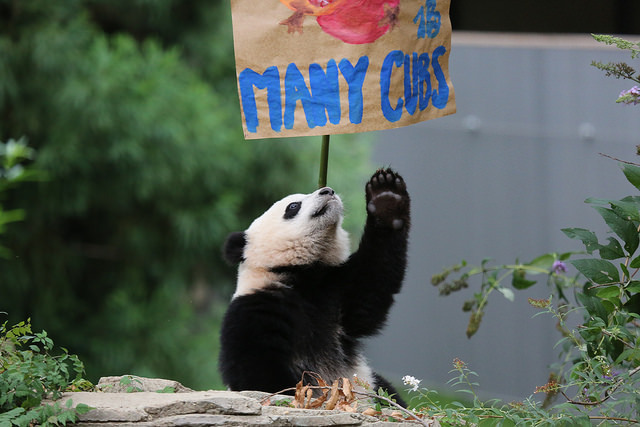 Bao Bao chose the peaches poster first. Zoo officials said in a press release that this means she will live "a long life as an ambassador for panda conservation," as per tradition. 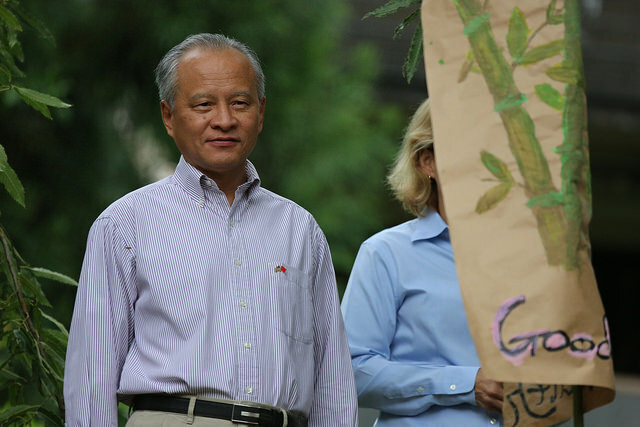 Chinese Ambassador Cui Tiankai watched near the bamboo poster. Bao Bao ended her Zhuazhou by playing by the pomegranate poster. 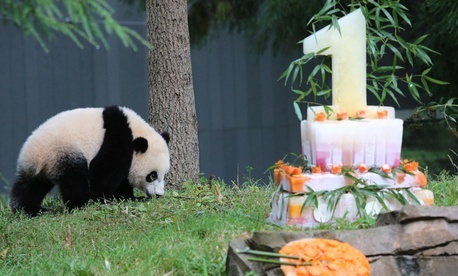 After the ceremony, Bao Bao was given a panda-friendly cake made by the zoo's nutrition department featuring her favorite flavors. The tiers are made of frozen diluted apple juice and were dyed varying shades of pink using beet juice; frozen between the tiers were apple and pear slices, some of the pandas’ favorite foods. The cake was decorated with flower appliques carved from carrots and sweet potatoes. In lieu of icing on the cake, a large number “1” carved from frozen diluted apple juice sat atop it. 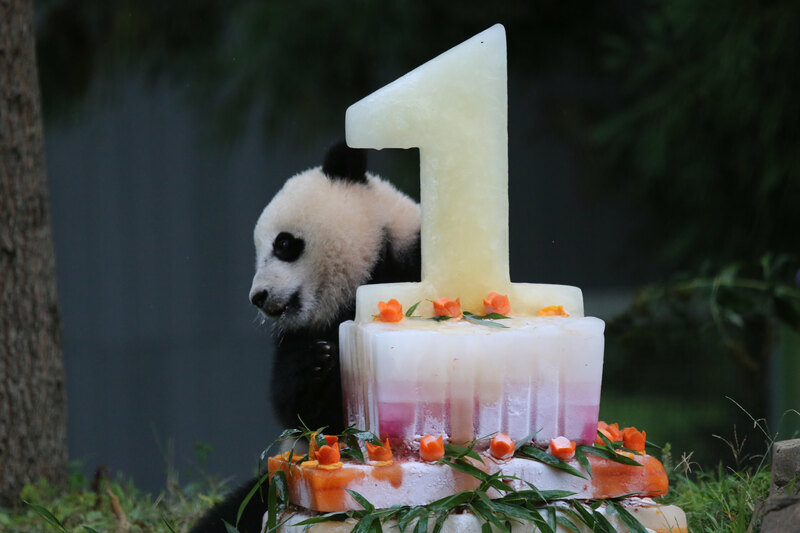 Bao Bao's cake was decorated with a large number 1. 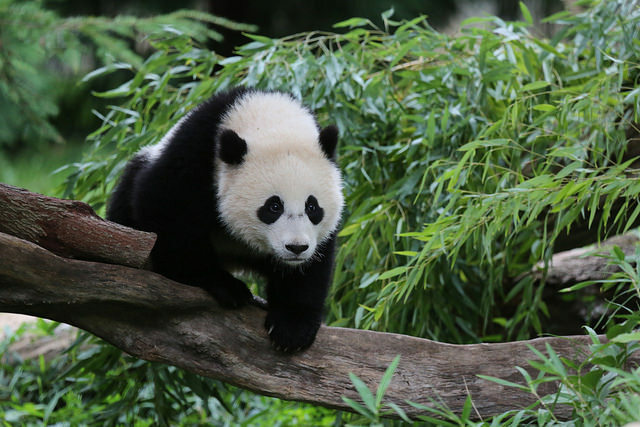 Bao Bao has been one of the zoo's most popular attractions since her 2013 birth. Earlier in the month, Bao Bao won the Smithsonian Summer Showdown , an online poll of the featured items in the museums' collections. Bao Bao beat iconic paintings of George Washington, the original Star Spangled Banner and the original recording of "This Land is Your Land" to be called "most iconic in the Smithsonian." Similarly, thousands voted in an online poll to name Bao Bao last year . Her name means "precious" or "treasure." Zoo director Dennis Kelly was happy with the public turnout at the cub's birthday. "This has been such a fast year,” Kelly said in a press release . “I remember feeling like an anxious father-to-be while waiting see if Mei Xiang was pregnant. Today, we are celebrating one of our biggest conservation successes. It’s been amazing for us, our members and all of Washington, D.C., to watch Bao Bao thrive and grow. She is so much more than just a beautiful 44-pound cub. She represents decades of collaboration between American and Chinese scientists." Smithsonian also announced that Bao Bao's first birthday coincided with the premiere webisode of the Smithsonian Channel's Wild Inside . The webisode recounts Bao Bao's birth, first year and her role as a panda ambassador for conservation. Previous Post | Is Pentagon’s ‘Security Cooperation’ Office Too Cooperative With Israel?